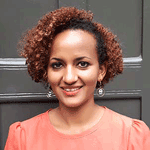 Lidet Tadesse Shiferaw, an Ethiopian, is a Policy Officer in the Security and Resilience Programme. She has an MA in International Peacebuilding from University of Notre Dame (USA). She’s interested in regional and multinational approaches to peacebuilding in Africa in general and the Horn of Africa in particular. Before joining ECDPM. Lidet has worked as an Independent Consultant where she supported research and advocacy efforts of various other civil society organizations engaged in east Africa. She previously worked as a Policy Advisor of the Life & Peace Institute, Horn of Africa Regional Program, where she supported the organisation’s policy engagement with the African Union and IGAD. Lidet has also worked as an intern at the Peace and Security Department of the African Union.